Wai boy joined in the celebration of grandma's birthday on 04 August 2013 for the very first time and as usual, it was just an immediate family members' gathering at 爷爷家 with some take-away food like Kentucky Fried Chicken, 大炒, Kajang Satay and of course a birthday cake. Despite little Wai boy is too young to enjoy those finger licking good food but he definitely enjoys getting the whole attention from all his 姑姐 and also other family members. After everyone present, we kicked start the celebration with a simple dinner and followed by the cake cutting ceremony. Grandma was carrying little Wai boy while surrounded by the rest of her grandchildren who sang her the birthday song before blowing out the candles together. We left 爷爷家 shortly after the cake cutting as the boys need to be in bed early especially when tomorrow is a school day. 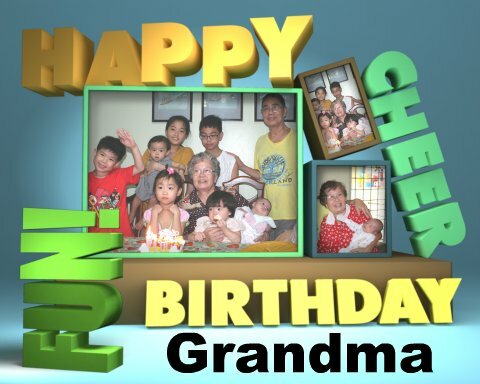 Mommy believed that both Kit boy and little Wai boy too had a great time with their grandparent. Once again we wish you 身体健康 and 天天快乐."